Ron Fuller liked toys. He enjoyed making toys, playing with toys and the pleasure that his own work brought to others, both young and old. Ron died on 2 July aged 80. He studied at Falmouth School of Art in the late 1950s where he met my mother Sue Jackson (neé Gealer), founder of Cabaret Mechanical Theatre (CMT). Ron’s child-like curiosity and inventiveness were already in evidence as he crafted canoes for romance and adventure on the River Fal, aided and abetted by my playful, exuberant mum; who was just 15 years old at the time. Ron went on to study at the Royal College of Art, where he met printmaker and his future wife, Moss Steed. He taught art for several years before they moved to Suffolk in 1972 and Ron became a full-time village toy maker. He was soon in demand to fix almost anything that the other villagers brought in. Sue was delighted to reconnect with Ron over 20 years later when she opened Cabaret in Falmouth. Ron’s wooden egg-laying hens, dancing can-can girls and quirky sand toys were a sell-out success. 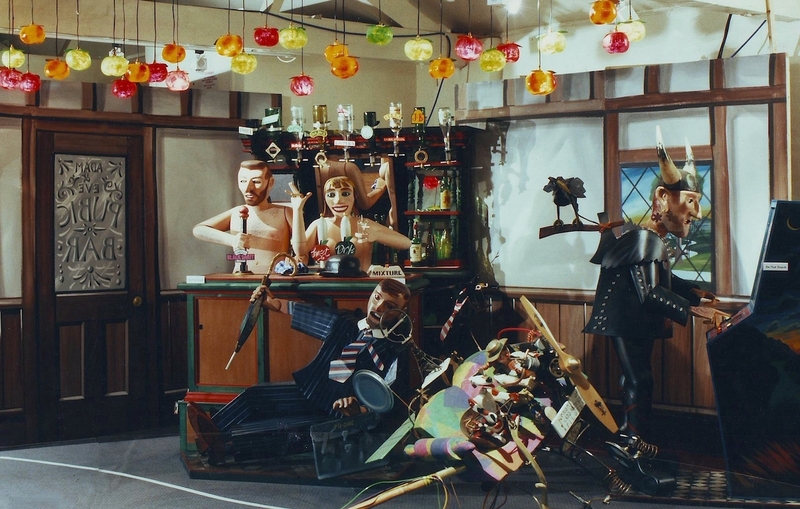 He created a pink policeman which signalled Stop and Go as visitors paid 50p to enter the exhibition of automata through fellow artist’s Peter Markey’s colourful turnstile. Ron soon became an integral part of CMT. When it moved to London’s Covent Garden in 1984, Sue needed a new entrance. She gave Ron a rubber stamp from Rymans, to get him started, from that he created the life-size ticket stamping man which delighted visitors until CMT closed in 2000. 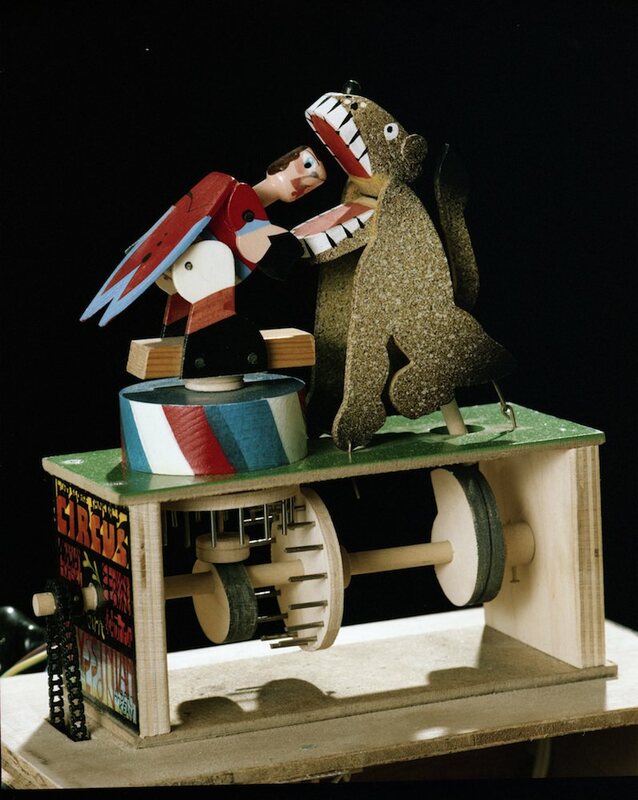 During this time, his toys became more mechanical and his Lion Tamer and Sheep Shearing Man became bestsellers. Ron Fuller must have been born a maker. His father was a wheelwright in Liskeard, Cornwall and his mother worked as a seamstress. So from an early age Ron worked in his father’s workshop shed and as a child he would take apart radios to see how they worked. He continued working with his hands for the rest of his life. For me the appeal of his work is his strong sense of design, choice of colours and typefaces. Many years ago on a walk with Ron I remember him stopping indignantly to point out the over use of different fonts on a poster on the village noticeboard. After Ron’s farewell gathering I asked his friend arcade owner Tim Hunkin for his thoughts on Ron’s uniqueness as an artist. Ron always described himself as a village toymaker. But behind this naïve front he could be magnificently subversive and politically incorrect. Shortly before he died we were talking about the first things we remembered making when we were kids. His was a gun. 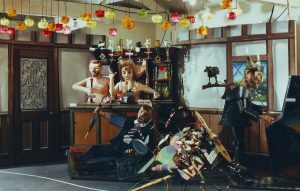 When the life size bar scene he made for The Ride of Life was put on display in Preston in 1994 the local paper described it as pornographic. It included the barman stroking the beer pump handle suggestively and other innuendo, but the public loved it. It was a pleasure and a privilege to have known Ron and he never failed to make me smile. He will be truly missed. Ronald Harry John Fuller born 21 August 1936; died 2 July 2017. Ron is survived by Moss and their sons Mark, Sam and Jake and foster daughters Carolyn, Lorna, Fi and Michelle. This article was published in the Crafts magazine of Sep / Oct 2017.